South Jersey Women for Progressive Change (SJWPC) connects, educates and empowers women to enact progressive change in our communities, state and nation. We are an intersectional action network that amplifies the voices of our members (including those who are trans and non-binary), engages in political discourse and actively works to dismantle systems of oppression. ​​South Jersey Women for Progressive Change was formed in 2016 by a few courageous women who sought to leverage the power of our community, the smarts of our members and the incredible foundation that has been laid by the women before us. 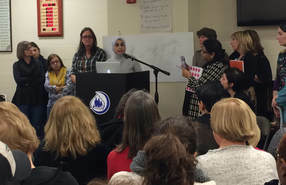 One of our first public meetings was held at a Mosque at the start of the 2017 Muslim Ban when 300 women stood behind our Muslim sisters to elevate their voices and support their work welcoming refugees into Camden County. We have since been active in local elections, met with elected officials, held panel discussions, marched for police accountability, held a film screening for trans awareness, successfully fought against partisan gerrymandering in NJ, inspired the Camden County Freeholders to pass a Fair and Welcoming Policy for Immigrants, joined the Journey for Justice Campaign, and ratified the Progressive Platform that drives our organizing today. Our members come to us from different backgrounds and we are committed to learning from one another's perspective and building from a place of intersectionality. After growing to more than 8,000 members, SJWPC organizes in support of Our Platform through our Political Engagement Committee and issue-based actions.